The 1919 Paris Peace Conference legendarily redrew the map of Europe, but had implications all over the world, as one might expect for the negotiations that closed a “World” War. 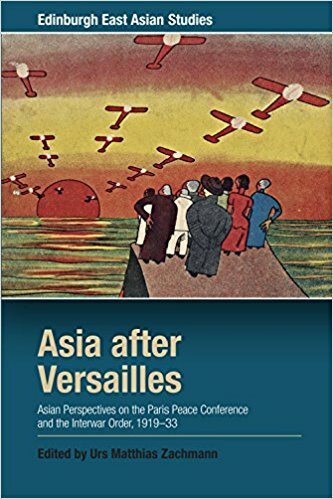 Urs Matthias Zachmann adds to the growing literature on its impact in the East by editing the nine-chapter collection Asia After Versailles: Asian Perspectives on the Paris Peace Conference and the Interwar Order, 1919-33, out now from Edinburgh University Press. Ably setting the scene, Mark Metzler’s “Correlation of Crises” examines the Great War as an economic explosion – a massive boom and sudden bust that saw crop substitutions, mass labour hirings and firings, and disruptions both good and bad. To cite one example, from Carol Benedict’s Golden Silk Smoke, the sudden squeeze on the growing and transportation of tobacco opened a sudden new market in southwest China, growing the drug for export to Europe. Tommy’s fags on the frontline created a sudden swell in wealth among Fujian farmers, and a similarly precipitous drop in their good fortune when the demand fell in 1918. Such big data, Metzler decrees, amounts to an early exercise in globalisation, with worldwide spin-offs in ideologies, revolutions and diseases. India, he observes, lost the most lives to the Great War, not merely on the battlefield, but to influenza and famine. Naoko Shimazu regards the Japanese delegation’s primary mistake to be one of “performance” – not realising that the media, and hence prevailing opinion, were best managed through public showmanship. The US President Woodrow Wilson was feted in Paris like a visiting Tsar, while the leading Japanese diplomat, Saionji Kinmochi, stayed out of the limelight. Although warned by their advance scouts in several panicky telegrams, the Japanese had failed to grasp that every other major power had sent a head of state, which was used as an excuse to keep Saionji’s team from joining the Big Four nations. As noted by Kevin M. Doak in his own chapter, Japan was also a proud but rather skittish monarchy, facing delegations from several newly minted republics. An anonymous critic in the Japanese press bemoaned the shame of Baron Makino having to tussle with a “comeuppance” like Wellington Koo – China’s first foreign PhD, a future prime minister and ambassador, snootily discounted as an arrogant bounder. But Koo was a compelling, eloquent public speaker, able to run rings around the Japanese delegation, whereas the Japanese attendees were all too often ridiculed over mispronunciations and misunderstandings. Shimazu herself does not mention, at least not here, the public spat between Saionji and his junior Konoe Fumimaro, which forced Saionji into damage control before the delegation had even reached France. Curiously for Saionji, a regular fixture among the brothels and bars of Tokyo and no stranger to backroom deals, he seems to have failed to appreciate the need for what Shimazu calls “shared sociality” – the need to have dined, drunk and debated with one’s peers outside the conference chambers. Saionji fatally avoided being seen at the right parties, although his young mistress was briefly a much-storied hit in her kimono. A century on, Gotelind Müller observes that the Paris Peace Conference is substantially better-known among Chinese teenagers than among their European counterparts. This, at least in part, is due to Wellington Koo’s infamous refusal to sign the Treaty of Versailles, marking an important moment of punctuation in the ongoing tale of China’s Century of Humiliation. It’s thus particularly ironic that the Chinese delegation should be so lionised and worshipped when they were far more at odds with one another than their Japanese colleagues. The Chinese at Paris were effectively representing two rival governments and acting to mollify the threat of angry mobs back home but somehow managed to present a united front. Ever the diplomat, Koo even played down the internal arguments in his own memoirs, not published until 1983. Hiroko Sakamoto closes the collection with a surprisingly light-hearted coda on what the Chinese and Japanese inadvertently shared: a love of cartoons, with Okamoto Ippei’s comics culture transplanted to Shanghai in the 1920s, just in time to fuel a strong movement of graphic protest and nationalism. Jonathan Clements is the author of biographies of Wellington Koo and Prince Saionji, the Chinese and Japanese delegates at the Paris Peace Conference. This entry was posted in China and tagged China, Japan, Saionji Kinmochi, Wellington Koo by ixarette. Bookmark the permalink.